Gupta P*, Chaudhari HK**, Kambhampati L***. This is a case report of fibroids in the lower segment of the uterus and broad ligament with live fetus in a multiparous woman that was managed by classical cesarean section. 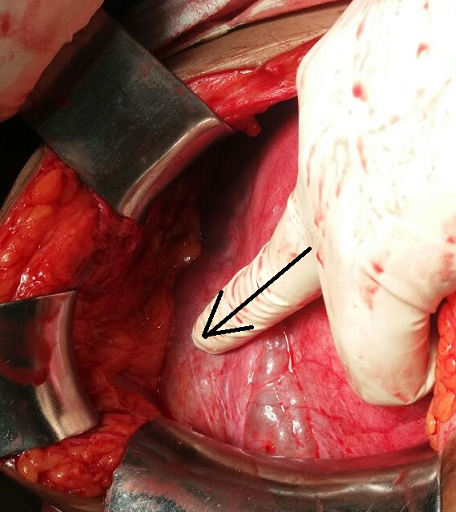 This case report depicts the successful method of management of such cases if encountered especially in case where lower segment cesarean section cannot be done due to the presence of fibroids. Leiomyoma or uterine fibroids are one of the most common benign tumors of the reproductive age group. These may remain asymptomatic or may present as an incidental finding in approximately 50% of the cases. Generally fibroids are associated with complications in pregnancy like malpresentations, dysfunctional labor, APH, PPH and also secondary infertility. [2,3] As these are estrogen dependent they may grow or undergo red degeneration during the course of pregnancy. Excessive blood loss may occur during surgery. However, in this case good preoperative workup and mapping of the fibroid along with careful planning of the classical cesarean section helped in the safe management of this patient. A 35 year old G3P2L2 was referred to our hospital with 36 weeks of pregnancy. Her general and systemic examination were normal. Her hemoglobin was 10.2 g/dl. On obstetric examination she was 36 weeks pregnant had a transverse lie and an additional firm mass of around 20 x 19 cms palpable below the umbilicus. On vaginal examination fibroid was felt below the presenting part. Ultrasound showed a single live fetus of about 36 weeks of gestation, with an estimated fetal weight of 2.45 kg and a fundal placenta. Multiple fibroids were also detected. A large fibroid of 21 x 5.6 x 11 cms extending from the fundus right up to the cervix in a ‘L’ shaped manner was seen; a 2nd intramural fibroid of 2.3 x 1.4 cms was seen in the anterior uterine wall. Another 5.6 x 3 cm intramural fibroid on the lower segment of the uterus was identified. A 4th intramural fibroid measuring 4.7 x 3 cm on the anterior wall of the uterus was also seen. As fetus was in the transverse lie, fibroid was felt below the presenting part, and the fibroid was in a L shaped manner going from the uterine fundus across the lower uterine segment, we counseled the patient for need of classical cesarean section as the lower segment cesarean section may have resulted in the extension of the incision onto the fibroid which would have caused excessive blood loss and possibility of an emergency obstetric hysterectomy. After the necessary preoperative investigations she underwent classical cesarean section. A live male baby weighing 3.07 kg was delivered out by breech presentation. Intraoperative observations also included the presence of multiple fibroids. (Figure 1, 2) A 4 x 3 cm fibroid was seen in the lower segment towards the left side, another fibroid with similar dimensions was near the fundus on the anterior wall. A large 15 x 10 x 10 cms broad ligament fibroid towards the right side extending from the infra hepatic region of the uterus to the lower segment of the uterus was seen. The fibroids were left alone to avoid any complications which might have occurred as pregnancy results in a hyper vascularized state of the uterus. The operation and the postoperative period were uneventful and the mother and the baby were both discharged on the 7th post operative day. The uterus was 20-22 weeks in size at the time of discharge. Figure 1. A 4 x 3 cm fibroid in the lower segment towards the left side. Figure 2. Oblique arrow showing 15x10x10 cm broad ligament fibroid towards the right side extending from the fundus below infra hepatic region to the lower segment of the uterus. Vertical arrow showing 4x3 cm fibroid in the lower segment towards the left side. Incidence of fibroids may vary from 0.1% to as high as 12.5%. Generally the fibroids are unaffected with pregnancy but in some cases it may increase in size by about 10%. Pregnancy complicated by fibroids increases the rate of cesarean section due to malpresentation and difficult labor. About 10– 30% of patients develop complications like red degeneration, infertility and torsion. In this case we were lucky that there were no complications seen. A classical cesarean section was planned as on ultrasonography the fibroid was visualized from fundus to the cervix and hence, any incision taken through the lower segment entailed the risk of going through the fibroid that would have entailed doing a myomectomy. 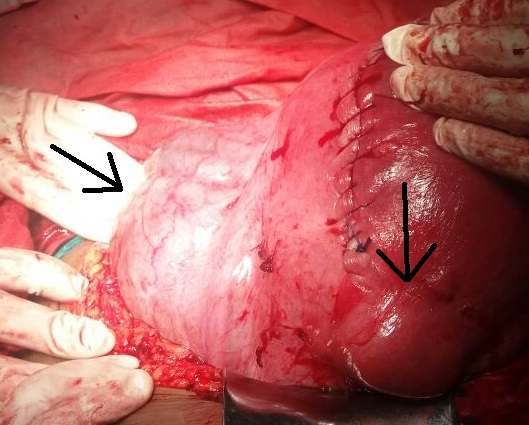 Even though recent studies have shown that there is no increased risk in performing myomectomy along with the cesarean section we wanted to avoid such an event in this patient as there were multiple fibroids present. As a huge fibroid extending from the fundus to the cervix would have got incised during a lower segment transverse incision and a myomectomy of this fibroid would have caused extensive blood loss a decision to perform classical cesarean section was taken. Therefore, the decision of not doing myomectomy with cesarean seems to be justified. In a study to evaluate the significance of number and the size of fibroids on the outcome of pregnancy by Ciavattini A. et al it was seen that increase in the size and the number of fibroids with pregnancy were associated with preterm births, malpresentations and higher incidence of cesarean section. Our patient also had a transverse lie and hence required a cesarean delivery. In a recent study by Ezzedine et al it has been advocated that cesarean section should only be advocated in cases where there are obstetric indications. In this case to the presence of transverse lie and huge fibroids in the lower segment favored the indication of a cesarean section and that to a classical one. It has also been advocated not to go for myomectomy during cesarean or during the course of pregnancy as it may complicate the pregnancy. Hence, in this case also the fibroids were left as such during the cesarean section. Our patient having multiple fibroids with pregnancy was managed successfully with classical cesarean section. The decision of not doing the myomectomy with cesarean section is also justified as the size, number of fibroids and chances of future complications were a deterring factor. Also we feel that in such cases a classical cesarean section should be the first choice of surgical management and not the lower segment cesarean section. Cramer SF, Patel A. The frequency of uterine leiomyomas. Am J Clin Pathol 1990;94(4):435-8. Jayakrishnan K, Menon V, Nambiar D. Submucus fibroids and infertility: Effect of hysteroscopic myomectomy and factors influencing outcome. J Hum Reprod Sci 2013;6(1):35-9. Lee HJ, Norwitz ER, Shaw J. Contemporary Management of Fibroids in Pregnancy. Rev Obstet Gynecol. 2010;3(1):20-27. Levy G, Hill MJ, Beall S, Zarek SM, Segars JH, Catherino WH. Leiomyoma: genetics, assisted reproduction, pregnancy and therapeutic advances. J Assist Reprod Genet 2012;29(8):703-12.
Cooper NP, Okolo S. Fibroids in pregnancy--common but poorly understood. Obstet Gynecol Surv 2005;60(2):132-138. Aharoni A, Reiter A, Golan D, Paltiely Y, Sharf M. Patterns of growth of uterine leiomyomas during pregnancy. A prospective longitudinal study. BJOG 1988;95(5):510-513. Lolis DE, Kalantaridou SN, Makrydimas G, Sotiriadis A, Navrozoglou I, Zikopoulos K, et al. Successful myomectomy during pregnancy. Human Reproduction. 2003;18(8):1699–1702. Ciavattini A, Clemente N, Delli CG, Di Giuseppe J, Giannubilo SR, Tranquilli AL. Number and size of uterine fibroids and obstetric outcomes. J Matern Fetal Neonatal Med. 2015;28(4):484-8. Ezzedine D, Norwitz ER. Are Women With Uterine Fibroids at Increased Risk for Adverse Pregnancy Outcome? Clin Obstet Gynecol. 2016;59(1):119-27.